↑ "Gujarātī". Onmiglot: online encyclopaedia of writing systems and languages. पहुँचतिथी 3 मई 2014. ↑ Swatee Kher. "These candidates say 'Majha Gujarat'". indianexpress.com. पहुँचतिथी 10 फरवरी 2015. 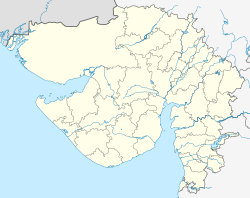 Surat, Valsad, Navsari and Dang in South Gujarat and Vadodara have large pockets of Marathi-speaking people who have close family ties with border areas of Maharashtra such as Thane, Nandurbar and Dhule. ↑ Ajay Mitra Shastri; R. K. Sharma; Devendra Handa (2005). Revealing India's past: recent trends in art and archaeology. Aryan Books International. प. 227. ISBN 8173052875, ISBN 978-81-7305-287-3. It is an established fact that during 10th–11th century ... Interestingly the language was known as the Gujjar Bhakha. ↑ "Sindhi Language". languages.iloveindia.com. पहुँचतिथी 16 फरवरी 2015. Sindhi is taught as a first language in the schools of Sindh and as a second language in Balochistan in Pakistan. In India, especially in the states of Maharashtra & Gujarat, Sindhi is either taught as the medium of instruction or as a subject by many educational institutions managed by Sindhi community. Due to its vast vocabulary, it is a favorite of many writers and therefore, much literature and poetry have been written in Sindhi. Southern Punjab, Balochistan, Northwest province of Pakistan (NWFP), Gujarat and Rajasthan are the places where dialects of Sindhi are spoken.